Here are some self-made bits and bobs for the guitars. For the wires I bought some small wires from an electronic store (Conrad) The plugs are made out of some small tubes and round profiles. You can get them in model railway shops. The gaffer tape is real gaffer tape. 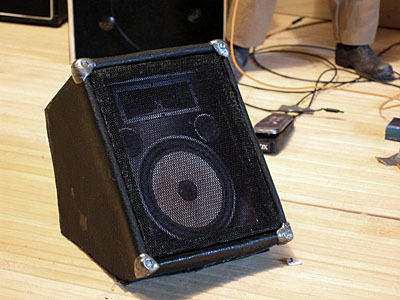 For the wah-wah and the other F/X gear I used balsa wood and sticked some photo texture on it. The controllers are again round H0 profiles. For the stucco I attached some carved pine wood profiles on the top end of the walls. The ceilling is at the moment just a number of styrofoam boards. 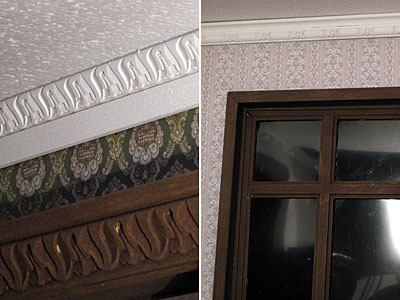 Maybe, if I can find some structured old-fashioned wallpapers, I will add them to the ceiling to simulate some stucco. When I take pictures and the ceiling is not in frame, I remove it for the light. 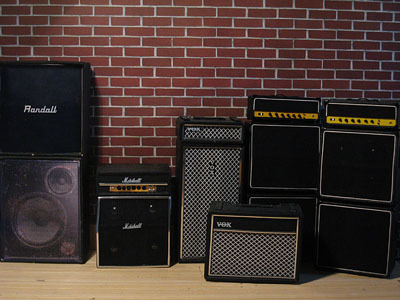 If you don’t want to do an unplugged session, you will need some amps and speakers. The two speakers on the left are homemade I used some balsa wood for the case, on which I paste up some synthetic leather. For the frontside I used some photo textures. 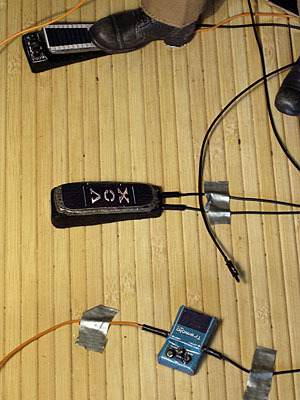 The monitorbox is homemade as well. Again it’s a balsa wood case with some fake leather on it and a phototexture on the frontside. It’s finished with a frame on which I string a grid canvas. The corners are modeled with Green Stuff. Meanwhile the second room got some wallpaper too. Same procedure. For the panelling I took a paperborder from a do-it-yourself-store and some pine wood profiles again. For the door I took also some texture and printed it. I think it’s okay for now. 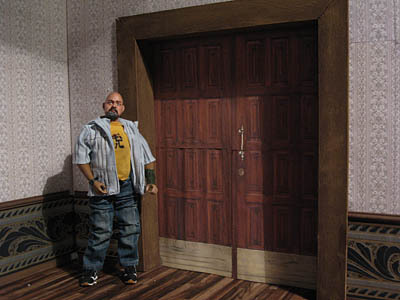 Maybe I will built a real door later. One of my project for the future will be a a rock stage for music celebrities and for a comic project about a rock band as well. I already worked on some props and I’m collecting music instruments for it. In some of my works I did some stage improvisations for Charlie Watts, Snoop Dogg and Keith Richards. There are a lot of music miniatures around, but unfortunately in many different scales and sometimes it’s not easy to pick up those that match the 1/6 scale or at least come close to that. I did a lot of research and I’d like to share my results with you. So here we go, starting with guitars. The spanish guitar was an ebay find in Hongkong. The Fender Stratocaster and the Fender Telecaster are from the Fender Collection from SD Toys, with some good luck you still find them on ebay. The first Gibson Les Paul is an ebay US find. The Gibson Flying V is from Spinal Tap too. the halfacoustic guitar is unbranded, looks like a Gibson, I think. It was an ebay Hongkong find as well. 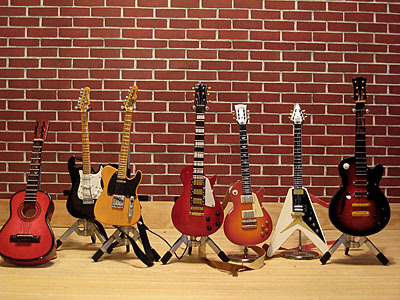 Would be nice to have Rickenbacker or a Gretch, but I haven’t seen this guitars in the 1/6 scale. 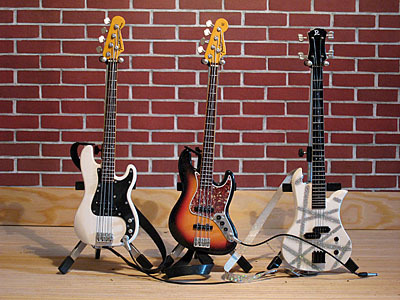 The third bass seems to be a Rickenbacker. It’s from Sideshows Spinal Tap. The bass guitar of Sid Visious from Medicom is a little bit too small, when you compare it with SD-Toys Fender Collection. I ordered an Ibanez and a Rickenbacker bass at Firebirds Art & Music, but as you know, the order never arrived here. So better stay away from those rooks. On the weekend I worked on the wallpaper for the first room. On the net you’ll find a lot of texture sources, for example CGTextures. Normaly this textures are used for 3D works, but I thought, why not use it for real objects. 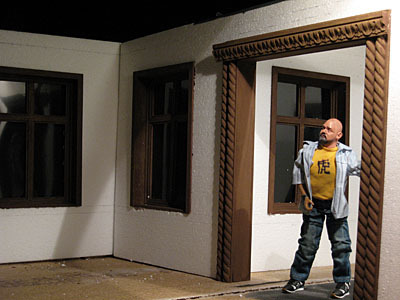 I used this technique already on the Joe’s Garage Diorama I was happy with the result so I did it again. I used a wallpaper tile and made printable stripes which I glued on my walls. My flat got a floor now. It’s a 2 m x 1 m PVC floor. It looks like some old dark wood. With it the location looks already homelike, I think. Maybe some of you, who visited my homepage, were wondering, that under “Coming soon” was an entry that says: „Music Instruments“ and that it never came. The reason was that: I took lots of pictures from my instruments, but I had ordered some more in an online shop. I was in good hope for the arrival and wanted to place the update as soon as the collection is complete. But the order never arrived here. I do a lot of online orders for the hobby and in 98% I made good experience, but unfortunately there are some crooks out there. 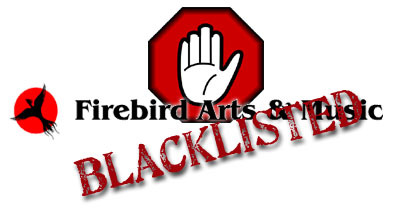 One of them, who needs to be put on the blacklist, is Firebird Arts & Music. I placed a 103 $ order at Firebird Arts & Music on 24 March, 2008. Exactly one month later I got an email, telling me, that my order is shipped now. Wow, it took them one month to put my order on the road. The guys are really not the fastest. Time went by and after 6 weeks I mailed them, telling I still was waiting, asking weather maybe something went wrong. No reply! Two weeks later and two month after their ”order shipped” mail I wrote again and asked for a tracing. No reply. Meanwhile I wrote several mails and got no reply at all. I tried to phone them in their office in Portland Oregon (a long distance call from Germany). Every time, and I tried a lot, there is only a bloody answering machine. I left a message twice, but it’s always the same. No reply! Now we are closed to three month and I don’t expect to see my order or the money. That’s more than only bad customer service. That’s a big rip-off. I wanted to let you know this. And I recommend, not to order at Firebird Arts & Music. 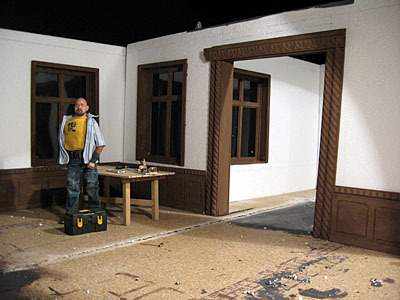 Yesterday I worked a bit on the wood panelling. It’s made out of three pieces. A 12 mm x 3 mm pine wood profile for the baseboard, a 100 mm x 5 mm balsa wood ridge for the main part, in which I carved some squares and a carved pine wood profile for the top. And the work continues. Here are the door frames. Again I used for the basic frame 40 mm x 5 mm pine wood profiles. For the big room i glued some carved profiles on the frame, in order to give it an old-fashioned look. Finally I painted and drybrushed it. Unfortunately the frame is a little bit out of the right angle. I hope that I can adjust that. You are currently browsing the about my work blog archives for July, 2008.